Petro Packaging is well known for outstanding quality and exceptional customer service. We are focused on accommodating customer’s specific requirements as quickly as possible while meeting our quoted lead times for custom extruded plastic tubing and plastic shapes. A well rounded company however gives back to the community through social responsibility and charitable giving. 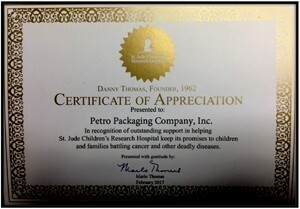 Each year, Petro Packaging donates to a charity or a non-profit organization chosen by one of our selected employees. This year our contribution was to St. Jude Children’s Research Hospital. We believe this tradition of giving motivates our company and employees, promotes unity and success as a whole, and contributes to our manufacturing success.